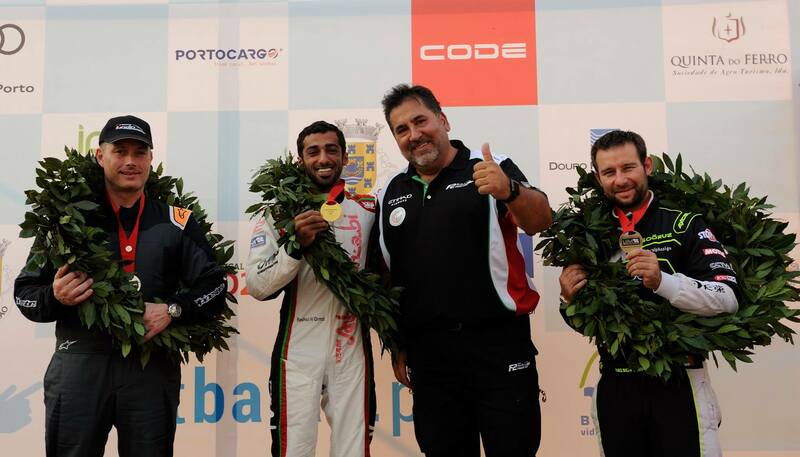 On the day that Duarte Benavente once again became the ‘talk of the town’ in Ribadouro, Portugal after taking the chequered flag at the final round of the 2017 UIM F2 World Championship, all eyes though were on Rashed Al Qemzi, who became the first ever Emirati to win the World title. said their delighted Team Principal Guido Cappellini. The project we started was to win the title in four years and today we have done it in two. 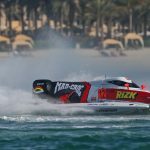 Due to adverse weather conditions that have plagued nearly every round of this year’s championship it came then as no surprise that the qualifying sessions would be interrupted and finally cancelled, along with any hope of staging the repechage. So the grid was formed up with the results from both Q1 sessions. That meant that Benavente would start from pole position. Finally the wind dropped and in calm conditions Benavente led the way at the start from Sweden’s Pierre Lundin, Ferdinand Zandbergen and Nelson Morin, with Al Qemzi down in ninth and needing to push his way through the field to prevent Lundin snatching a third F2 title in the forty-five lap race. Al-Qemzi made a good start and was able to move up to sixth on the opening lap, as Benavente and Lundin held on to first and second places. But after just three laps out came the yellow flag after Tobias Munthe-Kaas stopped on the course. With racing soon back under way Benavente continued to hold the lead from Lundin and Zandbergen, meanwhile Al-Qemzi had climbed to fifth after briefly slipping to seventh. 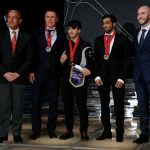 The Emirati remained on course for the world title and held his position through the next few laps behind Benavente, Lundin, Zandbergen and Comparato. As the race reached half distance Team Abu Dhabi began the agonizing countdown of the laps to the chequered flag. If the positions remained like this, Lundin would earn fifteen points Al Qemzi’s seven handing him the title by just five points. By two-thirds distance his job was made slightly easier when Zandbergen developed an engine problem, the team later discovered a damaged reed block was the cause, which robbed the young Dutch driver of a podium debut. With no further stoppages Benavente led Lundin by just 2.16 seconds and despite constant pressure from the Swede, the veteran Portuguese racer held on to seal an historic win on home waters by just 1.75 seconds. 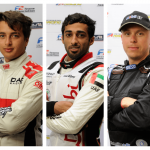 Comparato rounded off the podium and Al Qemzi reached the finish in fourth to claim the world title. This title is for everyone who has supported me and to the whole team for all their efforts this season. I knew what I had to do. Losing Q3 because of the wind did not help at all, but I managed my race well and we have been rewarded with the World Championship. Taking second place in both today’s Grand Prix and the World Championship overall was Pierre Lundin. he said after the podium celebrations had died down. Benavente did a really good job today, plus he’s way too experienced to loose a race from that position. Equally complimentary was the race victor. It was a real pleasure to race hard against all of these guys, there are no slow ones out there but they all race fair and as soon as they saw me in the mirrors they made it really easy for me to stay ahead of Lundin. If anyone asks how you do well in powerboat racing, then the secret to success is to enjoy yourself. 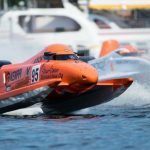 Third overall in the 2017 UIM F2 World Championship went to Nelson Morin from the China CTIC Team. The French driver continues the high standards set by the team after his brother Peter Morin took the runners up title back in 2014. 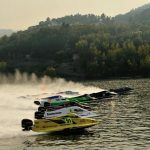 In the next couple of weeks the UIM General Assembly takes place in Montenegro and all eyes will be looking out for the dates and venues for the 2018 UIM F2 World Championship calendar, which will include some familiar and not so familiar venues.